It’s all my fault for being a sentimental schmuck. I could have made the toy go bye-bye a few weeks ago when I bagged a bunch of its stuffed comrades and hid them in the garage until I could make it to the Salvation Army. 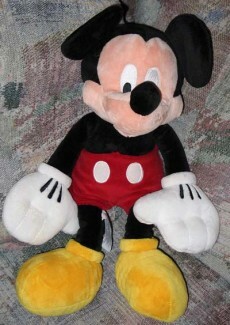 But because the Mickey Mouse was in Big Guy’s first Easter basket, I Iet him live. The Motherhood Muses are getting a good giggle out of the one now. Big Guy re-discovered Mickey last night, which means now I have a dose of Disney nagging on top of seasonal Santa sniveling. When Boots doesn’t need naps. When Boots gives up the stroller. Check, check, check and almost there, blast it. So now the only excuse left is the brutal truth: Mom hates amusement parks. Dad didn’t believe it either, until he took me to Great America when we were engaged and I barely made it off the Tilt-A-Whirl before losing breakfast. It’s not just the motion sickness. It’s the jostling crowds and the sun and the over-priced crappy food. Still, I know the day is coming soon when I’ll have to gut it out, because that’s one of the things parents do. And I’ll admit we’re entering the ideal Disney window. Both guys are functional enough to do it, but not jaded enough to try to sneak a peek at the person inside the costumes. They’re old enough that they’ll remember the trip but not so mature that they’ll miss part of the magic and wonder of the Magic Kingdom. Oh all right. We’ll figure out a way to make it work in the spring. I can endure the jostling and the sun and the walking for one day, because this is something a little kid should experience. Just keep me clear of anything that looks like a Tilt-A-Whirl. HEY – I still have Ryan’s BEAR from when he was 18 months old….and he is about to turn 20 in a little over 3 months.